After a punishing 16g HIC test, the dummies were bruised but still in working order! We are looking forward to seeing PF3000's on an Airbus or Boeing soon. In Q1 2018 PITCH secured the EASA ETSO C127b (16g) certification for the PF3000 seat. Following on from our C39b (9g) approvals in 2017 this allows the PF3000 to be installed in high density configurations with full HIC compliance. The seat is designed for single aisle Boeing and Airbus aircraft. PITCH Managing Director, Paul Broadaway, and Director, Gary Doy, proudly show the PF3000 EASA ETSO certificate. 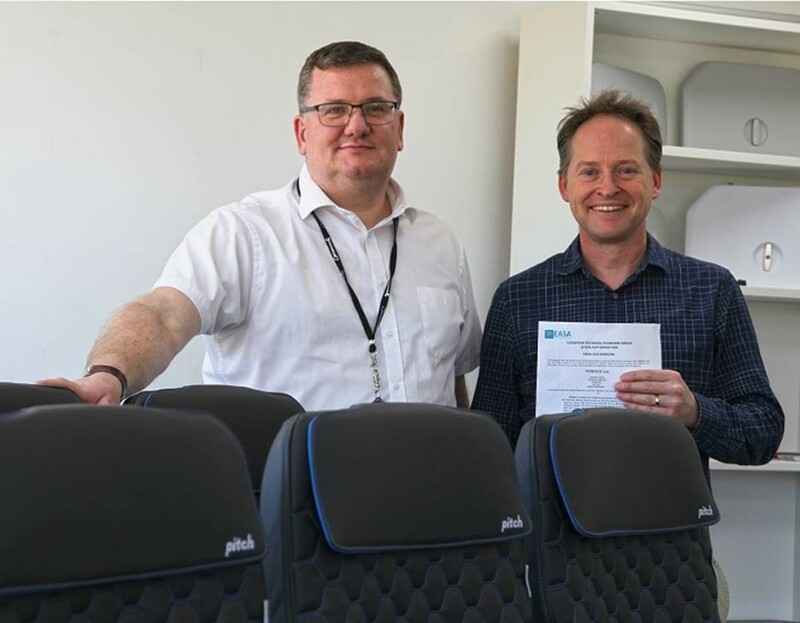 It's official, Hybrid Air Vehicles Ltd has announced Design Q as its preferred supplier for the design and manufacture of their luxury cabin interiors. This unprecedented project has been awarded to Design Q due to our extensive experience in specializing in the early stage design and build of luxury aircraft interiors. As part of a British Government Innovate UK investment in engineering design, HAV and Design Q have been awarded a UK Government grant to design an interior for the tourism variant of the Airlander. Hybrid Air Vehicles Ltd. and Design Q have been awarded a £60,000 Design Foundations Round 2 grant by the UK’s Innovation Agency, Innovate UK. This funding is going to be used in a unique and original ‘Airlander Luxury Tourism Design Development Project’. Design Q is one of the leading independent design consultancies with automotive and aviation clients throughout the world, including BAE Systems, Bombardier and Virgin Atlantic. Aerion Selects INAIRVATION to Develop World’s First Supersonic Business Jet Cabin “With INAIRVATION, we gain industry leading expertise from Lufthansa Technik, F/LIST and their preferred partners,” says Aerion’s Nichols. Aerion, the leader in supersonic technology, announced today that INAIRVATION will develop innovative cabin interiors for the AS2 supersonic business jet, as well as manage their certification and production. INAIRVATION GmbH, formed in 2014, is a joint venture between Lufthansa Technik AG and F. LIST GMBH, (commonly F/LIST) with preferred partners Design Q for interior design and SCHOTT for lighting. INAIRVATION is the first provider to offer completely integrated business jet cabin solutions. Representatives of INAIRVATION will be in the Aerion booth C9429 through the NBAA show, providing virtual tours of the AS2 cabin using Samsung VR viewing technology. Aerion Corporation of Reno, Nevada, was formed in 2002 to introduce a new era of practical and efficient supersonic flight. Over more than a decade, Aerion has demonstrated advanced wing technology in conjunction with NASA and other leading aeronautical institutions. This research includes breakthrough work in the area of supersonic natural laminar flow, the key enabling technology behind the company’s AS2 business jet. In 2014, Aerion entered into a collaboration with Airbus Group to develop the Aerion AS2 Mach 1.5 supersonic jet. Engineering is underway with first flight planned for 2021 and entry into service in 2023. On the eve of the 18th Anniversary of the formation of Design Q, we have launched our new website. Design Q is pleased to announce the launch of it fully integrated website www.DesignQ.co.uk The new site is more dynamic, contains extensive content and details the latest news hot out of the studio. Responsive across all devices the new platform is interactive, social, and user friendly. Simplified site navigation and enhanced search capability make it easy for you to guide around the site detailing our latest projects from design, engineering to visualisation. We will be launching fresh and exciting features throughout the year, so make sure you keep an eye out for our latest projects and all that’s happening behind the scenes. High res Design Q images can be downloaded from: https://designq.egnyte.com/fl/LpIlwKf0CZ All images must be credited "Design Q" and are made available strictly for editorial use. Any commercial, marketing or advertising use will be at the discretion of Design Q.